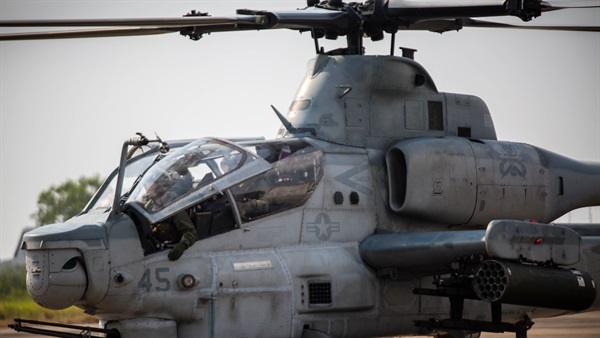 U.S. Marines with 1st Marine Aircraft Wing joined forces with service members from seven full participating nations to support the 37th iteration of Exercise Cobra Gold, at various sites in the Kingdom of Thailand, February 13-23, 2018. Exercise Cobra Gold 2018 is one of the largest theater security cooperation exercises in the Indo-Asia-Pacific region and is an integral part of the U.S. commitment to strengthen engagement in the region. It is intended to advance regional security and ensure effective responses to regional crises by bringing together a robust multinational force to address shared goals and security commitments in the Indo-Asia-Pacific region. “The Marines of Marine Light Attack Helicopter Squadron 369 are here to promote multilateral training and deliver close air support for the participating nations such as the Kingdom of Thailand and Republic of Korea,” said Maj. Kevin M. Keene, an operations officer and AH-1Z Viper pilot with HMLA-369, under the Unit Deployment Program with Marine Aircraft Group 36, 1st MAW. 1st MAW sent AH-1Z Vipers, UH-1Y Venoms with HMLA-369, CH-53E Super Stallions with Marine Heavy Helicopter Squadron 466 and KC-130J Hercules with Marine Aerial Refueler Transport Squadron 152, to provide aerial support for the exercise. Also, to build relationships and improve joint capabilities over a range of activities, to include enhancing maritime security and responding to large-scale natural disasters. According to Keene, a Carlsbad, Calif. native, HMLA-369 will take part in various training operations, such as live fire exercises, flight landings on Thai and Korean Navy ships, VIP lifts, and integrate with Thai Joint Terminal Attack Controllers. Designed to integrate the U.S. military with the Armed Forces of the Kingdom of Thailand and other partner nations, Cobra Gold demonstrates the commitment of Thailand and the U.S. long-standing alliance. Thailand is a key partner and an enduring ally continuing our broad cooperation on issues that assist both our countries, the region, and beyond. Our relationship with the Kingdom of Thailand remains one of our most important in Southeast Asia. “The Marines of HMLA-369 ‘The Gunfighters’ are excited to participate in Cobra Gold and be here in Thailand to work with our allied and partnered nations, and we can’t wait to show the nations in Southeast Asia what the Gunfighters are capable of,” said Keene. This exercise will improve combined responsiveness to crises in the Indo-Asia-Pacific region, and further reinforce our decades-long partnership. Also, it will test the interoperability and bilateral capability of the Thai and U.S. militaries to work together across a variety of areas including humanitarian assistance, disaster relief and a field training exercise.